P Morgan Chase & Co. Corporate & Investment Banking team in the Philippines / full-time Operations Analyst Development Program (OADP). Hello,Draw on all of your experiences and bring the whole you to JPMorgan Chase. We’ll make sure you have the training and opportunities to turn your talent into an exciting career. 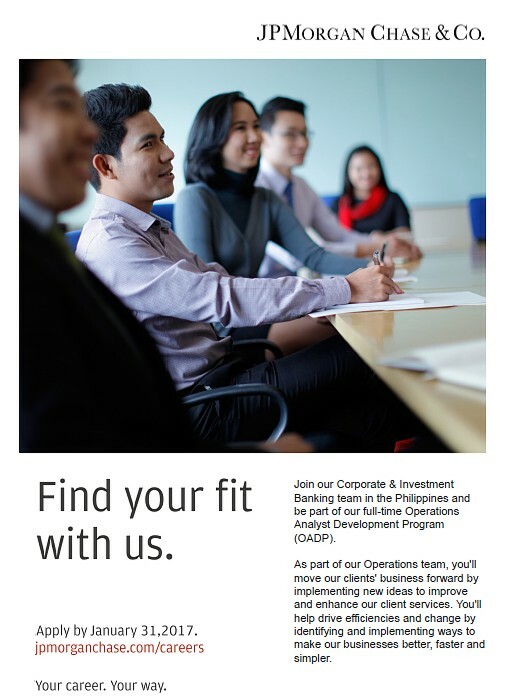 Wherever you want to go, and whatever you want to achieve, we’ll help you get there.Join our Corporate & Investment Banking team in the Philippines and be part of our full-time Operations Analyst Development Program (OADP). As part of our Operations team, you’ll move our clients’ business forward by implementing new ideas to improve and enhance our client services. You’ll help drive efficiencies and change by identifying and implementing ways to make our businesses better, faster and simpler. If you’re talented and driven to succeed, start your journey with us and visit our website to find out more. The deadline for applications for full-time analyst positions has been extended to February 28, 2017.